Maine's Department of Marine Resources (1998) states that A. pseudoharengus is an iridescent gray green or violet shade on top that fades down their sides to a silver underbelly. It usually has a distinct dusky spot just behind the upper margin of the gill cover. Its strongly laterally compressed body is three and one-third times as long as it is deep and has a forked tail fin. The midline of their belly is sharp and saw edged. Serrations located on the midline of their belly are much stronger and sharper than the ones found on most other members of their family. 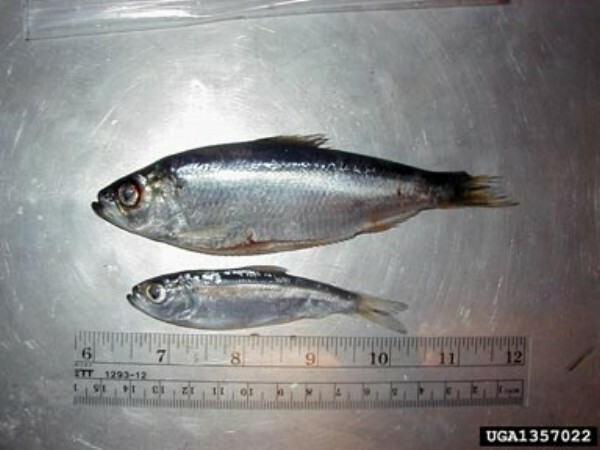 Adult alewives normally grow to be 25cms to 28cms (10-11 inches) in length and 230grms- 255grms (8 to 9 ounces) in weight.\" Alewives in land-locked populations rarely exceed 20cms (8 inches) long and most are 13cms to 18cms (5 to 7 inches) long (O'Gorman et al. 1997). Maine's Department of Marine Resources (1998) report that \"every spring, adults ascend rivers and streams to spawn in freshwater lake and pond areas. After the eggs hatch, the young-of-the-year spend two to six months in the freshwater environment, growing 4cm to 12.5cms (1½ to 5 inches) in size before they begin to migrate to sea.\"
The Nova Scotia Department of Agriculture and Fisheries (2001) report that \"A. pseudoharengus eggs, or roe, are canned and sold as a delicacy. The catch is used for fish meal lobster bait, pet food, or it is smoked, canned, salted, or pickled.\"
In lake habitats Alosa pseudoharengus are known to occupy all strata of a land-locked water body during the course of the year. Alewives have been found to prefer rocky habitats to sand sites along the Wisconsin shoreline. This may be related to their feeding on emerging insects associated with rocky areas (Janssen and Luebke, 2004). The majority of their time is spent in the limnetic zone (inhabiting fresh water). In late spring and summer they move into littoral areas (the region of the shore of a lake or sea or ocean) for spawning and move into deeper water during fall. Alewives have a preference for warmer waters. A. pseudoharengus move in large schools and are attracted to light. They move into shallow areas at night and return to deeper waters during the day. River populations of A. pseudoharengus are anadromous (meaning they migrate from the ocean to spawn in fresh water). They are found in river systems during spring migration, and are known to move further upstream than their close cousin, the American shad (Alosa sapidissima) (Chosid, Undated). The Department of Fisheries and Wildlife Science at Virginia Tech (VT-FIW, 2001) states that \"in anadromous populations, females mature a year later than males. A. pseudoharengus matures between the ages of 3 and 5. The fecundity of oceanic female is 48,000 - 360,000 eggs. Landlocked fish mature between 1 and 3 years of age and their fecundity is between 13,200 and 49,200 eggs. Spawning occurs from March to May in tidal freshwater streams and ponds. After spawning, adults return to the sea. Inland populations spawn from April to August in the shallow areas of lakes and streams. Adults pair during spawning and swim in spirals to the surface. The eggs of A. pseudoharengus are non-adhesive and sink to the bottom of calm, still waters.\" Spawning occurs at night. VTDEC (2002) states that A. pseudoharengus \"is planktivorous (their main food source is plankton), feeding predominantly on zooplankton as both juveniles and adults. However, large landlocked alewives also feed on the eggs and larvae of other fish species, as well as those of their own species\". Alewife were once purposely introduced into land-locked waterbodies to provide prey for piscivores although many such introductions were not sanctioned by management agencies.Lakes in the Adirondack Mountains and Otsego Lake, New York were illegally stocked with alewives for forage (Fuller et al. 2005)Fuller et al. (2005) brings up the possibility that alewife were introduced into Lake Ontario with American shad stockings in the 1880s, but he discounts this possibility in favour of the hypothesis that they reached the lake via the Erie Canal from the Hudson River. Fuller et al. 2005.Alosa pseudoharengus Nonindigenous Aquatic Species Database, Gainesville, FL. Recommended citation: Global Invasive Species Database (2019) Species profile: Alosa pseudoharengus. Downloaded from http://www.iucngisd.org/gisd/species.php?sc=625 on 21-04-2019. In the Laurentian Great Lakes, the alewife invasion has been associated with declines in abundance of emerald shiner (Notropis atherinoides), yellow perch (Perca flavescens), deepwater sculpin (Myoxocephalus thompsoni), and burbot (Lota lota). 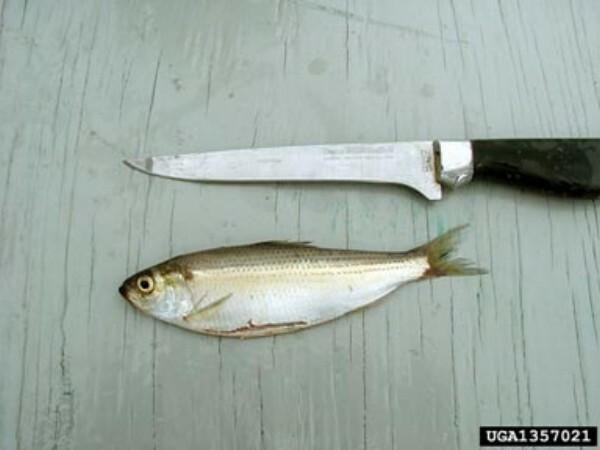 Alewives are suspected of interfering with reproduction of these fishes, most likely by preying upon the pelagic fry (Chuck Madenjian pers.comm., 2004). Multiple impacts have been reported by the Vermont Department of Environmental Conservation (VTDEC, 2002). Alewives are extremely efficient feeders on zooplankton. They feed selectively on the larger species and the larger individuals within a species, causing drastic alterations in zooplankton size, abundance and community structure. A. pseudoharengus out-compete other fish species for food. 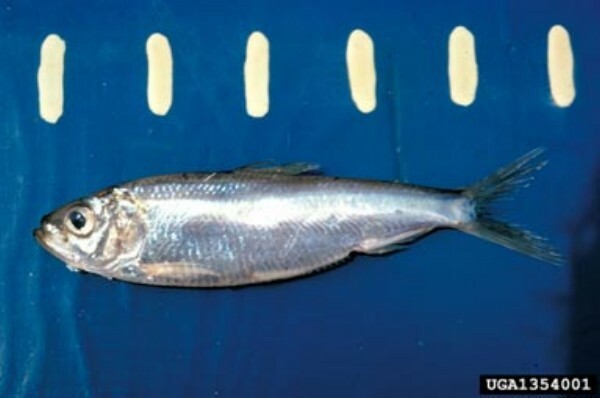 Alewives compete directly for zooplankton with other planktivorous fish, including yellow perch (Perca flavescens) and rainbow smelt (Osmerus mordax), and with the young of many piscivorous species, such as bass, which are dependent on zooplankton during the early parts of their lives. A. pseudoharengus feed on the eggs and larvae of other fish. Predation on yellow perch and lake trout (Salvelinus namaycush) larvae appears to be a significant source of mortality in those species.A. pseudoharengus are the cause of major reproductive failures in landlocked Atlantic salmon (Salmo salar) and lake trout populations. A. pseudoharengus undergoes periodic mass mortalities.The large numbers of alewives that die in these events wash up on beaches, causing foul odors and public health concerns. Any predator fish that utilises A. pseudoharengus populations as a main source of food will have difficulty finding enough to eat after an alewife mass mortality. This results in poor growth rates and declines in game fish. Land-locked alewives are high in thiaminase and Atlantic salmon and lake trout that eat mainly alewives produce thiamine deficient eggs which results in high mortality of fry from a syndrome linked to thiamine deficiency (O'Gorman and Stewart 1999). Biological: Several options for alewife management and control have been listed by VTDEC (2002). Population reduction can be achieved by the stocking of alewife predator species such as the brown trout (Salmo trutta) which feed predominately on alewives. Physical: An aggressive netting project can be undertaken when the alewives are vulnerable. Construction of barriers could prevent the spread of alewives downstream. Chemical: An extreme measure of using a piscicide which would kill all fish species within a lake is also suggested. Informations on Alosa pseudoharengus has been recorded for the following locations. Click on the name for additional informations. Bean, T. 2002. Alewife (Alosa pseudoharengus). Introduced Species Summary Project [Online Database]. Summary: Species fact sheet reporting common name, scientific name, classification, identification, original distribution, current distribution, site and date of introduction, modes of introduction, reasons why it has become established, ecological role, benefits, threats, control level diagnosis, and control method. Krueger, C. C., D. L. Perkins, E. L. Mills, and J. E. Marsden. 1995. Predation by alewives on lake trout fry in Lake Ontario: role of an exotic species in preventing restoration of a native species. Journal of Great Lakes Research 21(Supplement 1):458-469. Maine�s Department of Marine Resources, 1998. Alewife Fact Sheet. Summary: Species fact sheet reporting on background information, impacts, and general descriptions. O Gorman R., and C. P. Schneider. 1986. Dynamics of alewives in Lake Ontario following a mass mortality. Transactions of the American Fisheries Society 115:1-14. O Gorman, R., and T. J. Stewart. 1999. Ascent, dominance, and decline of the alewife in the Great Lakes: food web interactions and management strategies. Pages 489-514, in W. W. Taylor and P. Ferreri (eds. ), Great Lakes Policy and Management: A Binational Perspective. Michigan State University Press. O Gorman, R., B. F. Lantry, and C. P. Schneider. 2004. Effect of stock size, climate, predation, and trophic status on recruitment of alewives in Lake Ontario, 1978-2000. Transactions of the American Fisheries Society 133: 855-867. Vermont Department of Environmental Conservation (VTDEC), 2002. Alewife Fact Sheet. Summary: Species fact sheet reporting description, identification, impacts, problems, and management strategies. Bushnoe, T.M., Warner, D.M., Rudstam, L.G., and Mills, E.L. 2003. Cercopagis pengoi as a new prey item for alewife (Alosa pseudoharengus) and rainbow smelt (Osmerus mordax) in Lake Ontario. Journal of Great Lakes Research. 29 (2): 205-212. Chosid, D. UNDATED. Alewife Alosa pseudoharengus. New Jersey Division of Fish and Wildlife. Summary: Alewife fact sheet available from the New Jersey Division of Fish and Wildlife. Fitzsimons, J. D., S. B. Brown, D. C. Honeyfield, and J. G. Hnath. 1999. A review of early mortality syndrome (EMS) in Great Lakes salmonids: relationship with thiamine deficiency. Ambio 28:9-15. Fuller, P., Maynard, E., Raikow, D., 2005. Alosa pseudoharengus Nonindigenous Aquatic Species Database, Gainesville, FL. Harman Willard N; Albright Matthew F; and Warner David M., 2002. Trophic changes in Otsego Lake, NY following the introduction of the alewife (Alosa psuedoharengus). Lake & Reservoir Management. 215-226. Janssen, J., and Luebke, M.A. 2004. Preference for rocky habitat by age-0 yellow perch and alewives. Journal of Great Lakes Research. 30 (1): 93-99. Madenjian, C. P., G. L. Fahnenstiel, T. H. Johengen, T. F. Nalepa, H. A. Vanderploeg, G. W. Fleischer, P. J. Schneeberger, D. M. Benjamin, E. B. Smith, J. R. Bence, E. S. Rutherford, D. S. Lavis, D. M. Robertson, D. J. Jude, and M. P. Ebener. 2002. Dynamics of the Lake Michigan food web, 1970-2000. Canadian Journal of Fisheries and Aquatic Sciences 59:736-753. Madenjian, C.P., Holuszko, J.D., and DeSorcie, T.J. 2003. Growth and condition of alewives in Lake Michigan, 1984-2001. Transactions of the American Fisheries Society. 132 (6): 1104-1116. Madenjian, C.P., O�Connor, D.V., Chernyak, S.M., Rediske, R.R., and O�Keefe, J.P. 2004. Evaluation of a chinook salmon (Oncorhynchus tshawytscha) bioenergetics model. Canadian Journal of Fisheries and Aquatic Sciences. 61 (4): 627-635. Nova Scotia Department of Agriculture and Fisheries. 2001. 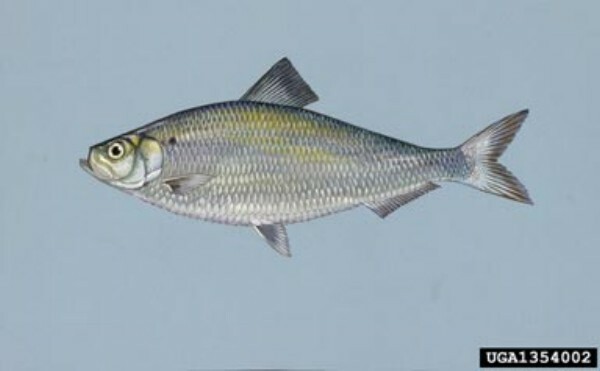 Alewife (Alosa Pseudoharengus). Inland Fisheries: Species Fact Sheets. Summary: Information on description, similar species, size, habitat, distribution, food habits, reproductive habits, and population status of species. O Gorman, R., D. H. Barwick, and C. A. Bowen. 1987. Discrepancies between ages determined from scales and otoliths for alewives from the Great Lakes. Pages 203-210 in R. C. Summerfelt and G. E. Hall editors. Age and Growth of Fish. Iowa StateUniversity Press, Ames, Iowa. O Gorman, R., E. L. Mills, and J. S. DeGisi. 1991. Use of zooplankton to assess the movement and distribution of alewife (Alosa pseudoharengus) in south-central Lake Ontario in spring. Canadian Journal of Fisheries and Aquatic Sciences 48:2250-2257. O Gorman, R., O. E. Johannsson, and C. P. Schneider. 1997. Age and growth of alewives in the changing pelagia of Lake Ontario, 1977-1992. Transactions of the American Fisheries Society 126:112-126. Owens, R. W., R. O Gorman, E. L. Mills, L. G. Rudstam, J. J. Hasse, B. H. Kulik, and D. B. MacNeill. 1998. Blueback herring (Alosa aestivalis) in Lake Ontario: First record, entry route, and colonization potential. Journal of Great Lakes Research 24:723-730. Virginia Tech Department of Fisheries and Wildlife Sciences (VT-FIW). 2001. The Virtual Aquarium: Alewife, Alosa pseudoharengus. Wells, L. 1977. Changes in yellow perch (Perca flavescens) populations of Lake Michigan, 1954-75. Journal of the Fisheries Research Board of Canada 29:889-898.